Australian sketch comedy You're Skitting Me returns for a third series. 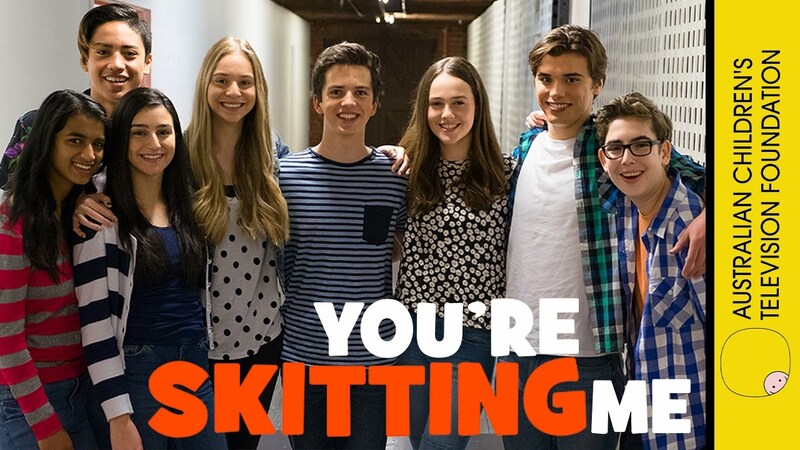 Performed by a new feature cast of teens, You're Skitting Me is an edgy mix of animations and great characters that will tickle everyone’s funny bone. The show is a 26 episodic comedy series of 12 minutes aimed at children aged from 8 to 14, but will be sure to provide a laugh for everyone. The series introduces regular characters such the Ultra Boy, the Unwrapping Guy, Young Shakespeare , Martine the Sick Bay Monitor, Child Lawyer - Roland McAllister, clueless Amanda Coyne, The Green Team. Animations are also a popular feature of the series with characters such as Iron Man and chats between emoticons, flies, and school bags. Nothing is too absurd! YSM is back for a third series and episode one is jam packed with astronauts preparing for Mars, Chewie under the desk, flies, school backs, Chewie, Bananas, Mystics and Megaphones! YSM is back for a third series and episode one features some Astronauts as they prepare to go to Mars. Chewie is under the desk. New animations from some flies – what’s worse, poo or brussel sprouts. Clueless Billy Blot shows us what to do when dressed as a banana. Mystic Mary proves her mystic powers and we find out when NOT to use a megaphone. Episode two of YSM features musical about Selfies and we meet our over zealous Sick Bay Monitor, Roland the Child Lawyer and wannabe school announcer Roula. YSM episode 2 shows you what to do with Chewie in the class room and what not to do if you're a head case. A teenager is lost in the bush and we meet new recurring characters Martine the Sick Bay Monitor and Volunteer School Announcer Roula. Martine takes control and Voula needs to check her facts. We also meet the schools naughty boys outside the Principal’s Office as they discuss appropriate places to go to the toilet. More animation with a scary ghost ride and the flies who don’t realise which way is up. Child Lawyer Roland Macallister is on the case defending his classmates from teachers wrong decisions. YSM Episode three features obsessed gamers, young teachers, scary movies and importantly how to create a straight line when pouring your sauce. YSM Episode features two video game obsessed teenagers, the school is introduced to the new ‘young principal’. We introduce more new characters with our Stormtrooper animation, Mystic Meg predicting the future, and Junior Ha’apai the YouTube “Unwrapping Guy”. The girls tell ghost stories in a scary sleepover and we follow the story of a girl who became “IT” for years. YSM Episode 4 shows you how to use your Brain, how to fix chewie in your hair, ads on the latest phone, a song about spooky spiders and we a young William Shakespeare at school. The boys in YSM Episode 4 show us the genius method using your brain to get a football out of a tree. We also learn how to cheat on a test in class and back in the sick bay, Martine Fraser shows us how to deal with the horror of gum in your hair. The girls continue their scary sleepover ghost stories. New character young Wil Shakespeare ‘entertains’ his classmates at school and we find out about a new Maxi phone from Zucchini and when NOT to use a megaphone. The cast also join together in a song about spiders. YSM episode five we ask the hard, hitting questions, have you ever been in love like Shakespeare or who would you rather be, Han Solo or Chewbacca? YSM Episode 5 shows you how far you can stretch your arm to reach for the chips, what to say if you’ve been sent to the Principal’s Office for the first time, and have you ever been in love like Young William Shakespeare? What happens if you are swatted as a fly and who would you choose to be, Han Solo or Chewbacca? The team coach is missing and is replaced by the phone and school announcer Roula tells us about her bus travel sickness adventures. Brain boy forgets his brain and Martine the Sick Bay monitor is back dealing with a stomach ache. YSM Episode 6 sees the return of the crazy Gomad product ads, ghost stories, balloon animals, dreamy Billy Blot and we meet Granny Alison! What do you love so much that you would marry it? The heavy school bag lift championship is taking place and we learn to be careful when taking your balloon animals for vaccinations. The Gomad ad series is back with “All New Vomit” and “Fart In A Can” and the girls have a scary tale about the old fashioned home phone. What happens during teenage growth spurts. Billy Blot gets caught ‘dreaming again’ and we meet Granny Alison for the first time. YSM Episode eight is all about competition, recycling, being quiet in the library and was the moon landing was real. We’re back in the arena for the Carton Crushing Championships, the Green Team are on a warpath recycling the soccer oval into a vegetable patch. Be prepared to be scared as The Shoosher shooshes students in the library. The cast discuss which is funnier, a fart at the dinner table or in the library? Can you ‘faceswap’ with your identical twin and Sick Bay Monitor quarantines a student with contagion and do you believe the moon landing was real? YSM Episode nine sets new hipster trends, plays it sun smart and the last kid on earth deals with survival. Peter is the last kid on Earth. We follow his tale as he works out how to survive. New hipsters are at a café setting a new trend. Scary sleepover girls have party dilemma. We advertise the latest sun safey suit on the market and meet new character, the super annoying Amanda Coyne. Young Shakespeare needs to go to the toilet and our animated flies and schoolbags talk rubbish and bananas. YSM Episode 10 is about selfie sticks, scary next door neighbours, more chewie and pranks. Episode 10 features Prankety Pranks – a parody TV show with surprising pranks. A student tries to get away with copying from Shakespeare. Chewie is stuck on a shoe. Do you leave a Frisbee if it’s in the scary neighbours backyard? Sick back monitor Martine retells her worst experience and new animation with ‘friends’ cat and dog. YSM Episode 11 has garage sales, student councils, ghost stories and crazy problem solving. Amanda Coyne is being annoying again with crazy solutions. A boy gets caught up in the wrong ‘virtual reality’ and the Student Representative Council try to move Casual Day Friday. Cat and dog have an animated discussion about their owners and the scary sleepover girls have a fashion calamity. New characters Couch boys who don’t move from the couch and our school announcer Roula stuffs up again. YSM Episode 12 has more Stormtroopers, girl talk and future school. The Lunchbox Disposal Squad save a young student from his lunchbox. Loaning books from the library is still cool. A Stormtrooper questions the galaxy he is from and its show and tell day with Young Shakespeare. The girls talk party wear and Martine conducts an operation in the sick bay. Future School Robot teaches the students about selfies. We ask the cast who takes the most selfies and where is your happy place? YSM Episode 13 has Life Hacks with Lila, couch boys wisdom and Granny Alison ranting about hoodies. Episode 13 features the classic yawn manoeuvre, Lila gives us some helpful life hacking tips. One student discovers the secret about algebra. The cast tell us what subject is a waste of time at school and our animation introduces us to stupid sports. Colonel McClown brings you the latest fast food fad and one Stormtrooper is fooled by a Jedi mind trick. The couch boys make short-term goals and we ask the cast what their short and long term goals are. Granny Alison is back ranting, this time about hoodies. YSM Episode 14 crashes bikes, a ‘doth off’, and takes a proper look at pineapple on pizza. Three’s a crowd on the lounge in Episode 14 of YSM. Young Shakespeare meets his nemesis Christopher Marlowe which culminates in a ‘doth off’. Chickens are for dinner in one animation and two mates make a video to show us how to make anything Aussie. pineapple on your pizza? Martine has to take action against a teacher to uphold the sick bay code of honour. Cat, dog and mouse discuss their weekend and Junior, the unwrapping guy, can’t complete unwrapping his parcel. YSM Episode 15 deals with fights in the school, smart phone terror and more future school. A fight breaks out in the locker corridor, smart phones create and on Teenager Tonight we meet Bradley Fletcher the bad ball boy. Future school students learn about sport. More lessons on when not to use a megaphone and Martine the sick bay monitor enforces a sick bay protocol – the old ‘lie-down’ technique. Roula the Announcer, takes its upon herself to play cupid. YSM Episode 16 meets the new kid at school, and naughtiest boy in school meets the naughtiest girl. There’s a new kid at school, a were-gameshow host takes over the loungeroom and Amanda Coyne thinks she can outsmart a check out assistant at the fruit shop. The cast discuss their annoying habits and Colonel McClown has release a new breakfast food. An animation is stuck in the cloud and Young Shakespeare reads a note from his mother. The naughtiest boy and the naughtiest girl have a chance meeting at the Principal’s office. Scary Sleepover girls continue their spooky tales and the cast tell us if they stand up for old people on public transport. YSM Episode 17 is on school tour, go musical on meeting the new kid and a girl who wears two straps. We go on an unusual and slightly over informative school tour with Emily and Peter. The cast go musical the New Kid and a student is embarrassed when his friend uses the megaphone inappropriately. Documentary story following Steph as she copes with wearing two straps. Amanda Coyne latest annoying to sharing muffins and Colonel McClown releases a cup of sugar. The boys are outside the Principal’s Office again and Roula, the Announcer, makes a “big” announcement. have? Roland McAllister, the child lawyer, is defending students put on detention and the sleepover girls continue their scary bedtime stories. An accident prone student gets rushed to the sick bay and a phone gets eaten with a bowl of rice. YSM Episode 19 has more of everything; Lockers, megaphones, mystics and chickens hatching. TV Parody “Locker Wars” auctions off school locker contents with surprising results. The science students are waiting for their chickens to hatch. The cast discuss what came first, the chicken or the egg. Two siblings take control and replace their Dad and Mystic Mary once again proves her majestic talent. Martine vows she will always be a sick bay monitor. YSM Episode 20 features the new adventures of Ultra Boy and the Chasey Championships. The new kid gets a tour of the schools’ friendship trees. Chasey Championship is in progress. Ultra Boy slides in to save the day and we ask the cast what superpower they would like to have. Martine explains what “sick bay” actually means and Child Lawyer Roland MacAllister tries to defend a gassy client. New animated characters “The Snot Guys” make an appearance with Cat and dog being scared at shadows. YSM Episode 21 features new stupid sports, marrying a pizza and new products to fake illness. Student, Bronny takes the teacher’s instructions of “You’re In Charge” a little too seriously with scary results. Gomad brings you the latest trick gadget, the “Sick Kit”, and we find out from the cast the where the worse place they vomited was. At Future School the Roboteacher tries to teach the students how to laugh and the knack of telling. More drama outside the Principals Office and our animated dog tries to be a cat. A pizza lover marries a pizza and the couch kids loose their TV remote. Disaster! YSM Episode 22 has rat’s nests, class clowns, new animation “The Snot Guys” and more spooky stories. Harry is not having a good hair day. Philip tries is trying to save face and to prove his worth to the school as the new Class Clown. Junior the Unwrapping guy has some mysterious black bags to unwrap and the girls continue swapping scary sleepover stories. New animation characters “The Snot Guys” giggle their way into our hearts. YSM Episode 23 features a new song about hump day Wednesday, new Quickchat boyfriends and more of Young Will Shakepeare. What would you do if your boyfriend kept disappearing every 10 seconds? When did the cast members get their first girlfriend or boyfriend? The cast sing a song dedicated to hump day Wednesday and our Weather monitors gets it wrong when she calls an emergency evacuation because of the extreme heat. Young Shakespeare continues to bore his class whether to 2B or not 2B. Plus how long can a new band be considered new until they are “old”? YSM Episode 24 follows a tough jock as he turns to dancing, and what to do when your Dad drops you off too close to the school. An emotional sports jock tries to quit basketball to become a ballet dancer. How to keep your Dad on his toes if he drops you too close to the school and we follow Jane and her friends as she recovers from an embarrassing incident. Also returning for more fun this episode are Roula the volunteer announcer, the Snot Guys and Ultra Boy on his next pointless mission. YSM Episode 25 has more of everything… Animal Onsies, Iron Man, Ultra Boy, and Martine the Sick Bay Monitor. Jane Gladwell hosts a documentary Natures World about animal onesies – is it still cool? We ask the cast if they like to dress up in fancy dress at a parties? Old fashioned Gwendolyn offers up advice on love and we find out what is Ultra Boy’s kryptonite is. Roula announces, wrong day for fancy dress and Martine educates us on what the all important sick bay monitor code is. A music clip devoted to ‘looking at your phone’. The latest wizard book is about to be released so some super fans are camping out. A time traveller arrives just in time with a critical message. The cast tell us what they would tell their younger selves if they could go back in time. Jealous friends find out their plain friend is not so plain, a lamington send a student to sick bay and Ultra boy saves a boys life from his sisters wrath!